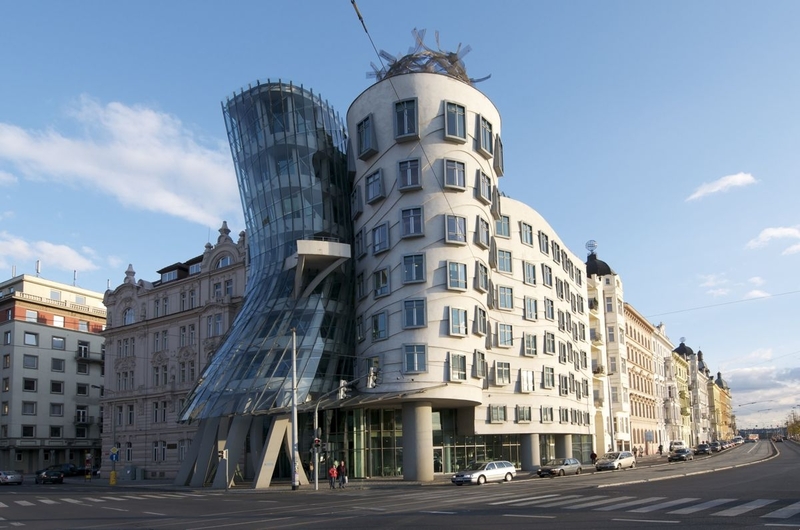 The dancing building was designed by the Croatian-Czech architect Vlado Milunić in co-operation with the renowned Canadian-American architect Frank Gehry. The building was designed in 1992 and completed in 1996 and it continues to fuel the debate about blending traditional architecture with progressive design. The building’s method of twisting concrete and steel together had never before been tried in Europe or elsewhere. The non-traditional design was controversial at the time because it stands out among the Baroque, Gothic and Art Nouveau buildings for which Prague is famous. 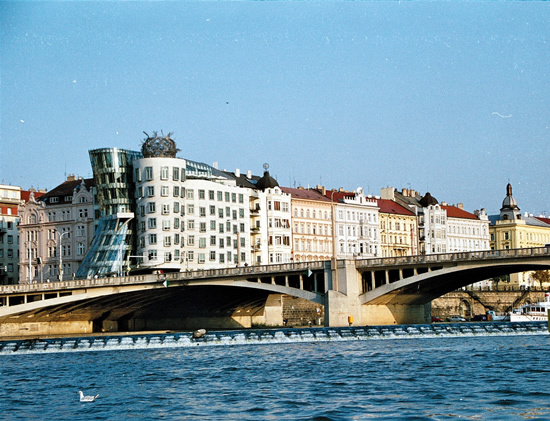 The dancing building is set on a property of great historical significance as its site was the location of a house destroyed by the U.S. bombing of Prague in 1945. The plot and structure lay dilapidated until 1960 when the area was cleared. The neighbouring plot was co-owned by the family of Václav Havel who spent most of his life there. As early as 1986 (during the Communist era) V. Milunić, then a respected architect in the Czechoslovak milieu, conceived an idea for a project at the place and discussed it with the then little-known dissident Václav Havel. A few years later, during the Velvet Revolution Havel became a popular leader and was subsequently elected as Czechoslovak president. The then Czech president, Václav Havel, who lived for decades next to the site, had avidly supported this project, hoping that the building would become a center of cultural activity. Gehry originally named the house Fred and Ginger (after the famous dancers Fred Astaire and Ginger Rogers as the house resembles a pair of dancers) but was later “afraid to import American Hollywood kitsch to Prague”, so refused his own idea. The building however is now seen as a work of art adding value to the cityscape of Prague.